To foster economic growth, the European Central Bank needs to revive the securitization market. Improved transparency, the clearing of bank balance sheets and improved regulatory rules should provide a catalyst for the securitization market, offering attractive yield opportunities for investors. In the aftermath of the financial crisis, the European securitization market collapsed. New issuance in European securitization decreased by more than 75 percent compared to 2008 and has not recovered since then. Primary market activity in 2013 was below 200 bn euro, corresponding to only 14 percent of US issuance over the same time period (see Figure 1). The lack of a functioning securitization market is a major disadvantage for European banks, the economy and investors. New issuance of asset-backed securities (ABS) remains subdued in Europe compared to the US. The European market is, however, forecast to pick up during the course of the year following the launch of the ECB's purchase program. In order to successfully foster economic growth, The European Central Bank (ECB) might need to expand the current pool of assets for quantitative easing (QE). The issuance of securitized investment products based on high-quality assets – so-called Qualifying Securitization (QS) – needs to pick up in order to broaden the ECB's investment base. To make the securitization market grow in Europe, it must become economically attractive for banks. So far, the maths have not quite worked out, mainly due to regulatory rules with respect to securitization that result in a lack of "capital relief" for the banks. Given their need to remain exposed to the part of the securitized assets with the highest risk, to which a risk weight of 1,250 percent is applied, the transaction simply lacks economic appeal for the banks. The ECB is in the middle of a multiyear process to regain investors' and market trust,. The comprehensive asset quality review (AQR) and the stress test carried out by the ECB and the European Banking Authority (EBA) can be seen as the basis for regaining that trust. In October 2014, following a yearlong analysis of over a million pieces of data, the ECB and EBA published the much-awaited results of the AQR and stress test. The AQR exercise covered 130 banks within the Eurozone's 18 countries, with total assets of 22.0 trillion euro accounting for around 82 percent of total banking assets under the European Single Supervisory Mechanism (SSM). The EBA stress tests covered 123 banks across 22 of the 28 EU countries, including banks from the UK and the Nordic region. Overall, 25 of the 130 banks failed, with an identified capital shortfall of 24.6 bn euro. More specifically, 13 banks were identified to face capital shortfalls totaling 9.5 bn euro. Fig 2. How Does Securitization Work? Despite not forcing the examined banks to take immediate action, the ECB made it very clear that the adjustments would become part of its ongoing supervision as it continues to forge ahead with the agenda of improving the quality of European banks' balance sheets. In 2014, the ECB released details of its asset-backed securities (ABS) purchase program. The ECB has appointed four executing asset managers for the purchase program. They will conduct the purchases on behalf of the Eurosystem and undertake price checks and due diligence prior to approving the transactions. The program will involve the purchase of senior tranches and guaranteed mezzanine tranches of loans originated in the euro area. Greek and Cypriot ABS will also be included in the purchase, albeit with tighter provisions. The combined size of the ABS purchase program and covered bond purchase program will reach 1 trillion euro. Several other measures have also been taken in the meantime to facilitate the development of the securitization market in Europe. Among them, we would highlight the changes to Solvency II regulatory rules for insurance companies, which made the capital charges less onerous for high-quality securitization. Further, rules on the Liquidity Coverage Ratio (LCR) for banks have also allowed some high quality securitization to qualify under certain criteria. The data published by the EBA and ECB should allow the market to better understand and quantify the eligible securities. From an issuer's point of view, there are currently situations where an unsecuritized portfolio may require less capital than a securitized portfolio (fig. 3). 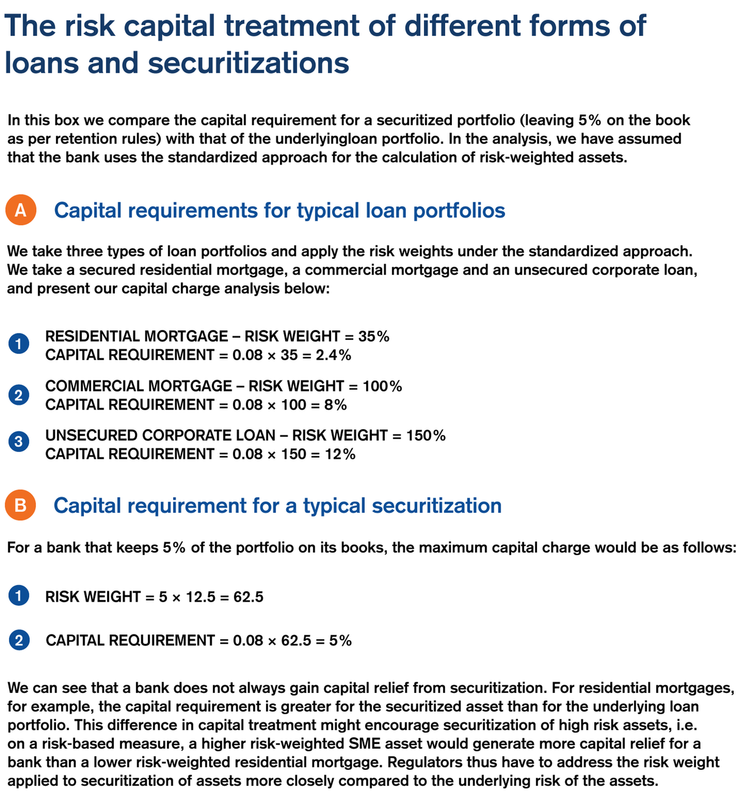 As a result, the loan portfolio to be securitized might contain a higher proportion of assets with a higher risk weight attached to it. Thus, we believe that securitization may take place in regard to high-quality small and medium enterprise (SME) loans due to the higher risk weights applied. This is precisely the area where the ECB is trying to unlock the funding gridlock. With securitization accounting far from clear under International Financial Reporting Standards (IFRS) and a likely piecemeal approach to capital relief, we have tried to estimate the potential size of qualifying securitization assets for Europe. Depending on the range of assets taken into account, we have adjusted the data for asset encumbrance and estimate that the market could range from a minimum of 1 trillion euro (including mainly SME loans) to 2.4 trillion euro (including lower risk-weighted asset categories such as securitized or collateralized lending). From the asset breakdown, we predict that securitization is more likely to reopen bank funding channels for SMEs and corporate lending as we would expect the capital relief to transmit into lower sustainable funding costs in these sectors. We therefore believe that securitization can play a key role in serving the macroeconomic policy objectives of the ECB to foster economic growth. Given the completion of the AQR and the launch of the ABS purchase program, we believe that these are supportive steps toward a fully-fledged securitization market throughout 2015. It is expected to provide a positive backdrop for the Eurozone by releasing capital pressure from banks' balance sheets, reducing the cost of borrowing for SME clients and providing lending to the economy. In an environment of very low yields, investors (including the ECB) will gain access to higher-yielding assets, which we expect to be attractively priced at the beginning to reopen the securitization market.